The answer is “Yes.” Here are some simple procedures you can perform before opting for the expense of a service call: Check disconnect switches (indoor and outdoor if you have a split system). Make sure that circuit breakers are ON and that fuses have not blown. Check for sufficient airflow. Make sure air filters are clean and that supply-air and return-air grilles are open and unobstructed. Check the settings on your thermostat. If you want cooling, make sure the temperature control selector is set below room temperature and the SYSTEM switch is on the COOL or AUTO position. If you want heat, make sure the temperature control selector is set above room temperature and the SYSTEM switch is at HEAT or AUTO. The FAN switch should be set at AUTO. Can I troubleshoot my air conditioner before calling for service? Yes, check out our service troubleshooting section for some help on what you can check to possibly avoid the expense of a service call. Could there be a service charge if I have an extended warranty? Yes. The extended warranties offered do not cover maintenance or damage due to external causes. Do I need a new heating and air conditioning system in order to purchase extended warranty protection? No! 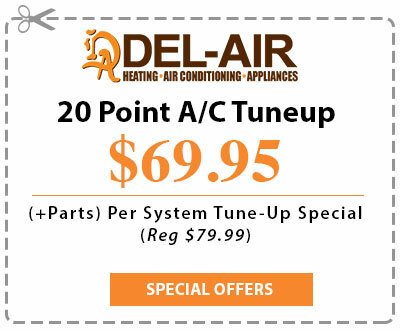 Along with extended warranties designed for new systems, Del-Air offers extended warranties for existing systems one year and older. How do I flush out my drain system? If your air conditioning drain line has a tee installed, remove the cap and pour one gallon of hot water down the drain slowly so water will not back up into the overflow shut off. Following the hot water, a cup of vinegar may be added to inhibit future buildup in the drain line. How do I pay for extended warranty protection? Extended warranty protection is a one-time charge for the life of the coverage, paid for at time of service. There are no hidden costs. I have seen my outdoor unit’s fan go off and on when in heating. Is this normal? Yes, this is typically associated with the defrost cycle on a heat pump and is part of the normal operation. It may also occur on certain model units when heat is running and the temperatures are slightly warmer inside and outside. My air conditioner does not seem to be cooling, so I turned the thermostat down. Shouldn’t it work better if it is set to a lower temperature? No, turning the temperature down further will not make it cool any better and may only compound the problem. If your air conditioner does not seem to be cooling, there may be a problem with its operation and a professional should be called to check the system. My outdoor unit makes some unusual noises on cold nights. Is there any reason to be concerned? Not typically–on a cold night a heat pump’s outdoor coil will freeze and it must be defrosted to maintain the unit’s heating efficiency. During this process the system will shift modes and may make some loud “whooshing” noises. When you’re frustrated by an equipment breakdown, it can be tempting to find the least expensive “quick fix” to get on with your life in relative comfort. That “quick fix” may be the least expensive option now, but it may not give you the most value–or cost you the least–in the long run. Paying for repairs on an old or inefficient system often simply prolongs the inevitable. It’s almost like putting a bandage on a serious injury. An older system that breaks down once is likely to break down again… and again. That means more emergency service calls or, worse yet, the risk of damage to your home or to other components of your heating and cooling system. There’s also an ongoing cost factor to consider. Restoring your old system will only bring it back to its current level of energy efficiency. After you’ve recovered from the repair bills and the frustration of system breakdowns, you still won’t save on your energy bills. Even six-year -old heat pumps and air conditioners are considered grossly inefficient by today’s energy efficiency standards, as are most furnaces built before 1980. With new high-efficiency equipment, you could save up to 60% on your energy bills. That’s why installing a new heating and cooling system can actually pay for itself in energy savings within a relatively short time. When one component of your system breaks down unexpectedly, it’s easy to just focus on repairing or replacing that component. However, each part of your system works with the others to boost efficiency and reliability, so it helps to keep the big picture in mind. Replacing your old furnace with a new higher-efficiency model but leaving your old mechanical thermostat in place, for example, won’t allow you to enjoy all the efficiency advantages the furnace has to offer. Likewise, if you install a new furnace but don’t get a humidifier, the air may seem cooler, forcing you to operate your new system at a higher temperature to be comfortable. Plus, you can often save on installation costs if you have several components of your system (for example, a furnace and air conditioner) replaced at the same time. What can I, as a homeowner, do to maintain my air conditioning equipment? Inspect and change your filter as needed and flush out the drain system on a monthly basis. What do the extended warranty plans cover? Plans cover labor and parts for products that fall under normal wear. They do not cover normal maintenance. What temperature should I set my thermostat to for cooling and heating? It is best to set the temperature to a setting that is comfortable for your individual preferences. Typically, most people are comfortable between 76-78° for cooling and 68-70° for heating. Why do I need extended warranty protection? Parts and labor costs continue to go up. One service call to replace a minor part can easily cost $100.00 or more.